"Hella Good" is a song by the American ska band No Doubt from their fifth studio album Rock Steady (2001). Written by Gwen Stefani, Tony Kanal and The Neptunes (Pharrell Williams and Chad Hugo), and produced by Nellee Hooper and the band, "Hella Good" was released as the album's second single in April 2002 and received positive reviews from contemporary music critics, who made comparisons to the work of a diverse range of artists such as Afrika Bambaataa and Madonna. Commercially, "Hella Good" was successful, and the Roger Sanchez's remix of the song topped the US Billboard Dance Club Songs. For the 45th Grammy Awards, the National Academy of Recording Arts and Sciences introduced new categories for Best Dance Recording and Best Remixed Recording, Non-Classical. "Hella Good" was nominated for Best Dance Recording, but lost to Dirty Vegas' "Days Go By", and Sanchez's remix won for Best Remixed Recording, Non-Classical. No Doubt performed a medley of "Underneath It All" and "Hella Good" at the ceremony. The accompanying music video for "Hella Good", directed by Mark Romanek, was filmed in March 2002 and released in April 2002, and it features the band squatting in an abandoned ship. The song was featured in the opening sequence of the 2005 film The Longest Yard, covered by Rita Ora at Radio 1's Big Weekend, and was also used for the second season Alias episode "The Getaway" in 2003 and in the pilot episode of The Black Donnellys in 2007. No Doubt decided to work with hip hop production duo The Neptunes as a sort of "cultural collision". Lead singer Gwen Stefani wanted to write a high-spirited and celebratory song about the positive things in her life, so they wrote an optimistic upbeat song. The word hella was a slang term used mostly in the San Francisco Bay Area and other parts of California to mean "very". Having toured in the Bay Area, Stefani borrowed the term to describe her mood. Stefani wanted to use the word dance in a chorus, so she decided to end each line of "Hella Good"'s chorus with the phrase "keep on dancing". The song's funk sound is based on songs such as Queen's 1980 single "Another One Bites the Dust" and The Commodores' 1977 single "Brick House". The song's hook is performed on the bass. "Hella Good" is a rock song composed in the key of G minor. It is written in common time and moves at a moderately fast 115 beats per minute. The song is influenced by electro, punk and funk music. The song's beat drew several comparisons to that of Michael Jackson's 1983 single "Billie Jean". Its hook comes from a simple progression of power chords alternating between G and A flat, suggesting Phrygian mode. "Hella Good" follows a verse-chorus form with a chorus following each of the two verses. Following the bridge, the chorus is repeated and the song closes with an outro. About.com ranked the song number one in a list of the top five singles from Stefani's career, with the band as well as solo, reasoning by saying that the song's "bumping contemporary beat pushes along 80's style keyboards making it nearly impossible to keep from moving your body." Blender described it as a "blazing start" to Rock Steady and compared it to the work of pop group Was (Not Was), rapper and producer Timbaland, ska punk band Fishbone, and electro DJ Afrika Bambaataa. The NME also compared the song to Bambaataa's music as well as that of Britney Spears and Duran Duran. PlayLouder called the track outstanding and compared Nellee Hooper's production to the electroclash style of Chicago house DJ Felix da Housecat. Entertainment Weekly characterized the song as a sequel to Madonna's 1985 single "Into the Groove". The publication listed "Hella Good" seventh on its list of the top singles of 2002. It went on to include the song in its list of the top five No Doubt songs, in which it described the song as "a dance-pop delight irresistible enough to make you forget that ''hella'' is one of history's most irritating slang terms." Stylus Magazine was pleased with the use of overdubbing in the song's "anthemic rock chorus", but referred to its lyrics as stupid. Billboard referred to the group as the B-52's of the 2000s and praised "Hella Good"'s combination of a strong bassline; "fairly aggressive electric guitar accents"; Kraftwerk-style electronics; and Stefani's "loose, playful" vocals. The song was listed at number twenty-six on the 2002 Pazz & Jop list, a survey of several hundred music critics conducted by Robert Christgau. In the United States, "Hella Good" reached number 13 on the Billboard Hot 100. The single was more successful in mainstream markets, reaching number three on the Top 40 Mainstream and number nine on the Top 40 Tracks, and topping the Dance Club Songs chart. It had success on adult contemporary stations, peaking at number nine on the Adult Top 40 and later appearing at number three on the Top 40 Adult Recurrents. It had some crossover success in urban contemporary markets and reached number 29 on the Rhythmic Top 40 chart. Interscope Records approached DJ Roger Sanchez to produce a remix of the song, which went on to top the Dance Club Songs chart. The single was less successful on the Canadian Singles Chart, where it peaked at number 26 for three non-consecutive weeks. On the UK Singles chart, "Hella Good" debuted at number 12 but was unable to reach a higher position. The single peaked at number eight on the ARIA Singles Chart in June 2002 and remained on the chart for three months. It was listed at number 64 on the 2002 year-end chart, and it was certified Gold by the Australian Recording Industry Association. "Hella Good" was successful in South America and reached the top-five in Argentina and Chile. In New Zealand, it peaked at number 17 and spent fifteen weeks in the chart. Stefani riding a waterjet scene from the music video. The black-and-white music video was directed by Mark Romanek. Not following any plot, the video depicts the band as a group of punk rockers squatting in an abandoned ship while the rest are chasing Stefani throughout the ship. During the course of the video, the band members perform the song, using bodyboards to float electronic equipment, and they and their friends explore and dance throughout the ship. There are also sequences of people riding on personal water crafts, Stefani performing on a coiled rope, people playing Jet Set Radio Future, and Stefani broadcasting on a pirate radio station. Romanek came up with the video's concept it and e-mailed it to the band. He based it on a black-and-white Italian Vogue fashion shoot from the mid-1990s which featured models on waverunners. The video was then filmed over three days in March 2002 in Long Beach, California. The scenes inside the ship were filmed from man-made sets at South Bay Studios. The music video was moderately successful. Following a premiere on an episode of MTV's Making the Video, it reached number four on the network's video countdown Total Request Live. The video debuted on MuchMusic's Countdown in April 2002 and peaked at number six, spending over four months on the program. ^ "45th Annual Grammy Awards - 2003". Rock on the Net. Retrieved July 21, 2007. ^ D'angelo, Joe. "Norah Jones Sweeps Grammys, Boss Wins Three, Avril Shut Out". MTV News. February 24, 2003. Retrieved September 30, 2007. ^ Grant, Kieran. "No doubts at all". Jam!. Retrieved September 6, 2007. ^ a b c "Hella Good". Making the Video. MTV. March 30, 2002. ^ Montoya, Paris and Lanham, Tom. "Hella Good". The Singles 1992-2003. November 25, 2003. Interscope Records. ^ Orshoski, Wes. "No Doubt Feels 'Rock Steady'". Billboard. November 21, 2001. July 12, 2007. ^ a b Sheet music for "Hella Good". Hal Leonard Corporation. 2001. Richardson, Sean. "Still kicking". The Boston Phoenix. December 2001. Retrieved September 30, 2007. Bastow, Clem. "Top Ten Drum Beats You Are Powerless To Resist". Stylus Magazine. September 9, 2005. Retrieved September 30, 2007. ^ a b Hiatt, Brian. "Reasonable Doubt". Entertainment Weekly. Retrieved September 30, 2007. ^ Lamb, Bill. "Top 5 Gwen Stefani / No Doubt Singles". About.com. Retrieved September 13, 2007. ^ Howe, Rupert. "No Doubt : Rock Steady Review" Archived 2007-09-30 at the Wayback Machine. Blender. Retrieved September 5, 2007. ^ Needham, Alex. "No Doubt : Rock Steady". NME. Retrieved September 5, 2007. ^ Perry, Dan. "No Doubt: Rock Steady (2002) review". PlayLouder. January 16, 2002. Retrieved September 6, 2007. ^ Browne, David. "Rock Steady (Music - No Doubt) | Music Review". Entertainment Weekly. December 10, 2007. Retrieved September 5, 2007. ^ Browne, David. "The best and worst". Entertainment Weekly, issue 687/688, page 126. December 20–27, 2002. ^ Delaney, Colleen. "No Doubt - Rock Steady - Review". Stylus Magazine. September 1, 2003. Retrieved September 5, 2007. ^ Taylor, Chuck. "No Doubt: Hella Good". Billboard, volume 114, issue 17, page 33. April 27, 2002. ^ "Pazz & Jop 2002: Critics' List". The Village Voice. February 18, 2003. Retrieved October 7, 2007. ^ a b c d e f g h "Rock Steady". Allmusic. Retrieved January 8, 2007. ^ Thomas, Misty. "A Quick Little Chat with Roger Sanchez". JIVE. October 3, 2003. Retrieved September 30, 2007. ^ a b "No Doubt Hella Good". Top40-Charts.com. Retrieved August 15, 2007. ^ "No Doubt - Hella Good". Australian-Charts.com. Retrieved August 15, 2007. ^ "End of Year Charts - Top 100 Singles 2002". Australian Recording Industry Association. Retrieved April 14, 2007. ^ "ARIA Charts - Accreditations - 2002 Singles". Australian Recording Industry Association. Retrieved April 14, 2007. ^ "No Doubt - Hella Good". ^ "The TRL Archive - Recap - April 2002". ATRL. Retrieved September 5, 2007. ^ "MuchMusic Countdown" Archived 2009-01-13 at the Wayback Machine. MuchMusic. Retrieved September 5, 2007. ^ "Australian-charts.com – No Doubt – Hella Good". ARIA Top 50 Singles. ^ "Austriancharts.at – No Doubt – Hella Good" (in German). Ö3 Austria Top 40. ^ "Ultratop.be – No Doubt – Hella Good" (in Dutch). Ultratip. ^ "Ultratop.be – No Doubt – Hella Good" (in French). Ultratip. ^ "No Doubt Chart History (Canadian Digital Songs)". Billboard. Retrieved July 23, 2018. ^ "Offiziellecharts.de – No Doubt – Hella Good". GfK Entertainment Charts. ^ "The Irish Charts – Search Results – Hella Good". Irish Singles Chart. 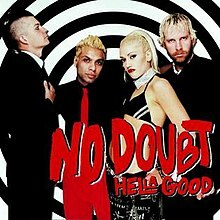 ^ "Italiancharts.com – No Doubt – Hella Good". Top Digital Download. ^ "Dutchcharts.nl – No Doubt – Hella Good" (in Dutch). Single Top 100. ^ "Charts.nz – No Doubt – Hella Good". Top 40 Singles. ^ "Swisscharts.com – No Doubt – Hella Good". Swiss Singles Chart. ^ "No Doubt: Artist Chart History". Official Charts Company. ^ "ARIA Charts - End Of Year Charts - Top 100 Singles 2002". ARIA. Retrieved July 23, 2018. ^ "Top 100 Songs of 2002 - Billboard Year End Charts". Bobborst. Retrieved July 23, 2018. ^ "ARIA Charts – Accreditations – 2002 Singles". Australian Recording Industry Association. Retrieved July 23, 2018.